Daniel Rabel (Paris 1578 – 1637), was the son of Jean Rabel (1545 – 1603), the official artist at the court of Henri III who was acquainted to Jean Dorat, the most prominent Hellenist, or Greek scholar, of his days. Daniel Rabel, Jean’s son, was therefore brought up in the best of French intellectual circles, but he did not become a Hellenist, a Greek scholar. Nor did he become a poet. He chose instead to walk in his father’s footsteps, but, as we will see, not entirely. He was a painter, an engraver, a miniaturist and a decorator. As well, following once more in his father’s footsteps, Daniel Rabel was a court artist. and because he is associated with the Grotesque art of early seventeenth-century France, an aesthetic. * His botanical art will not be discussed in this blog. Much of Daniel Rabel’s artwork can be viewed at Google Images. Until the invention of photography, artists were often asked to make a miniature painting or drawing of a fiancée, a daughter, a wife, a husband. Among other miniatures, Daniel was commissioned to make a miniature portrait of Henri III’s fiancée, Anne of Austria (1601 – 1660), which benefitted his career. In 1612, he became the official artist of the duc de Nevers, Charles de Gonzague. Between 1631 and 1632, he was also official artist to Gaston d’Orléans, Henri IV‘s third son. In 1633, scientist Peiresc (Nicolas-Claude Fabri de Peiresc), an astronomer among other pursuits, wrote letters to Rabel to commission paintings of privately-owned antique vases. These letters are still extant and are housed in the Carpentras library. Daniel Rabel also painted landscapes (oil paintings) and hunting scenes. However, on the sole merit of his two paintings of the Ballet de la douairière de Bilbao, housed in the Louvre Museum, Rabel would be considered an important artist influenced by the Grotesque fashion which has its counterpart in French poetry. However, by 1618, Daniel Rabel had settled in Saint-Germain-des-Prés, where he painted his Suite de fleurs (1624). Rabel works, including his plates, are housed in the print room, the Cabinet des estampes, of the National Library of France, la BNF (Bibliothèque nationale de France.) The two paintings (shown above) of the Ballet de la douairière de Bilbao are kept in the Louvre. Grand Ballet de la douairière de Billebahaut (Bilbao) 1626. I am including two related blogs, but posts dealing with the flamenco are not listed. 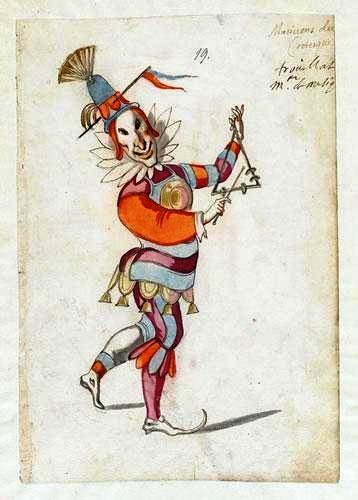 The picture at the head of this post shows a bal masqué, a masquerade bal. It is an example of the “grotesque” style. We have therefore introduced a new element, the grotesque and, in particular, Daniel Rabel’s grotesque depictions of the bal or the ballet. When Daniel Rabel was designing costumes and involved in stagecraft, there were several “grotesque” poets. However, 17th-century grotesque was a brief phenomenon. The “grotesque” is usually associated with the 19th century and the Middle Ages. A good example of the grotesque is Victor Hugo‘s The Hunchback of Notre-Dame of (Notre-Dame de Paris), published in 1831. Hugo (26 February 1802 – 22 May 1885)wanted to challenge a restrictice notion of beauty and created Quasimodo, a character most would consider repulsive. Esmeralda loves the hunchback despite his looks. Remember that, in Beauty and the Beast, Beauty accepts to marry Beast when he is still Beast. She can see beneath the surface. Other writers of the nineteenth century in France also felt there were different forms of beauty. For instance, when Charles Baudelaire (9 April 1821 – 31 August 1867) published his Fleurs du Mal (The Flowers of Evil) in 1857, he was also questioning a narrow perception of beauty. [i] “stagecraft.” Encyclopædia Britannica. Encyclopædia Britannica Online. Encyclopædia Britannica Inc., 2012. Web. 10 Aug. 2012. <http://www.britannica.com/EBchecked/topic/562420/stagecraft>.